‘I thought I would use this time to get closer to God. I guess in a way I have, but not in the way I was expecting. I have found him in my group members.’ Students from Newman College share their reflections on walking the Camino de Santiago. In November 2018, three groups set off from Newman College to walk part of the Camino de Santiago. Fr Sacha Bermudez-Goldman SJ accompanied the first group. All three groups began their Camino in Portugal walking north to Santiago. They all departed on different days. Some of the students, who preferred not to be named, share the following reflections. They are words written during and after the Camino. 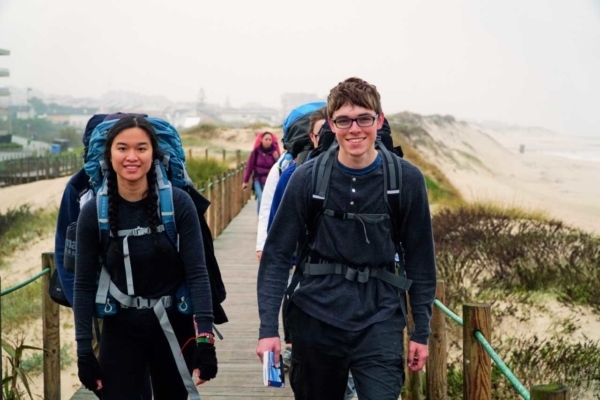 Newman College students walk the Camino de Santiago in November 2018. We are now on day 11 of El Camino. It has been such a great experience. I do not want it to finish. I thought I would use this time to get closer to God. I guess in a way I have, but not in the way I was expecting. I have found him in my group members. I like the dynamic of our group. We walk quietly but talk and laugh a lot during our breaks and at the albergues. Alasdair has such a big heart and he transmits to us his love for nature. Eloise has such a strong spirit and she never complains even when I can see she is in pain. Mark is the glue of the group and makes us laugh so much. Sussanna has the most contagious laughter ever. Ikee has been such a responsible leader and has selflessly taken care of everyone, even when this means cleaning everyone’s blisters. Liam is the best storyteller I have met. I really like his summaries of the day. Nina is so sweet; she gets excited about everything and enjoys even the simplest things around her. I have also gotten to know many things about myself that have surprised me in good but, also, bad ways — many things I want to keep but also many things I want to change or improve about myself. One of my favourite parts was when we crossed the border between Portugal and Spain. I wish all borders were like this one: a simple line on the floor. If these countries, which used to be enemies, managed to have this, there is hope. For me, the Camino was a world within itself. It offered me a challenge that was unlike anything I’d experienced before. A very self-focused and busy lifestyle in my regular life in Melbourne was broken up by a journey that centred on the innate spirituality of the people you meet and the places you go, and the spirituality of yourself both in relation to others, but also on its own. The challenges to your body, mind, and soul tested the limits of each of those elements, but also educated me on their relationship to each other. The difficulty of the walk is given meaning by the landscape that envelopes you, from beautiful hamlets to cosy villages, from beachside boardwalks to inner-city cobblestones, from tree-lined bush trails to farm roads flooded with last night’s rain and cow pats. My Camino was a rollercoaster of emotion, in which I learned not only about myself, but also the world. My senses are so activated during the journey, and I am more aware of my connection with the world. The smell of the forests after the rain, the smoke from the countryside kitchen chimneys, the sound of water and wind, the touch of sun and rain … all these things that I took for granted make me feel so grateful. I thank God for his creation and for the gift of life. The Camino journey enables me to go deeper and reflect on what I value most. I realise that I enjoy nature and quietness so much. I spent a lot of time thinking about my family when I was walking alone. This pilgrimage helps me understand ‘God in all things and in all things God’. I think I am so used to seeing what I want to see and hanging out with those who are similar that I miss some great opportunities to appreciate people around me. It is such a blessing to know these new beautiful hearts on the Camino. It truly was an experience I will never forget. I learned many things about myself and the people with whom I walked — both good and bad. Since being back in Australia, I feel much more grounded within myself. I wouldn’t say that the Camino ‘changed’ any part of me, but rather it opened my eyes to areas of myself that I didn’t really know existed. It can be interesting to see what comes up in the conversation with yourself after already walking five hours for the day. So, thank you for the amazing opportunity it was to walk 250km with some old friends and new ones. There are not often moments in everyday life to reflect on where we are going. A pilgrimage is a search for enlightenment, for self-betterment — something I hoped would be sudden and effortless, some kind of bolt from the blue that would make me instantly stronger, kinder, more grateful and lighter on my feet. But of course, this wasn’t the way of my Camino. Instead it was often slow, tedious and riddled with blisters. It was bickering and complaining and saying things you do not mean while in constant battle with the self to keep moving, keep walking, keep pressing on — even when your feet feel like they’re falling apart. It was also the little moments of grace: the colour in the sky and the churches that took your breath away; the strange familiarity of strangers and smell of damp eucalyptus; the process of growing closer to yourself and each other, and that strange, bittersweet feeling at the end of it all when you finally see that grand old cathedral rising out of the street in front of you.